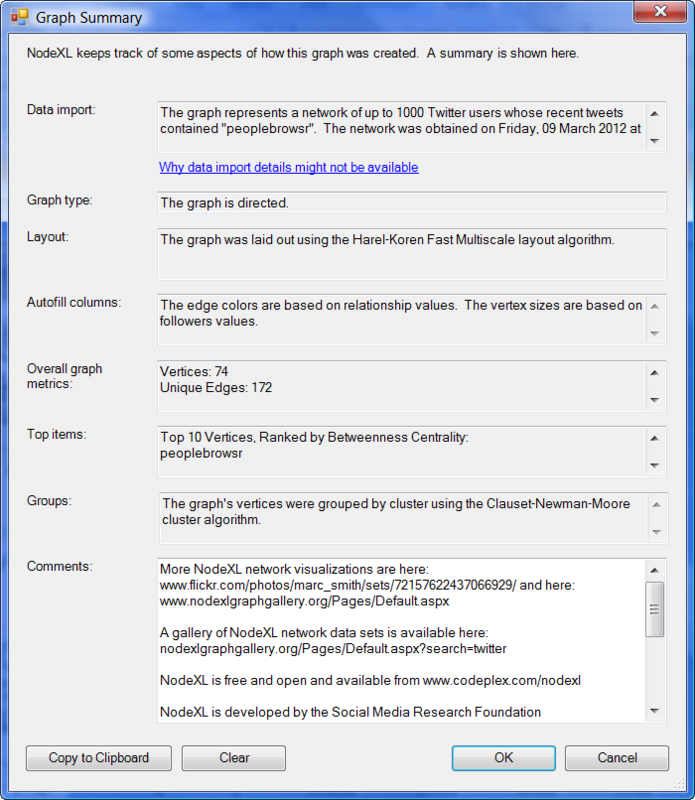 The NodeXL team has just released a new version of the application. Version 320 of NodeXL has some important changes. prior to installing this version. Benefits: NodeXL will now provide automated updates. Everyday NodeXL will check for updated code and patch itself automatically. This is the LAST update for NodeXL that will require user involvement. We will push new features out to users as they are available and they will just show up in user’s applications. 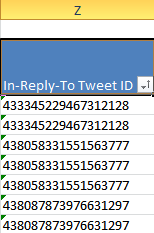 Imported Twitter networks now have an “in-reply-to tweet ID” column. This is a useful data element for building “paths” that capture how information flows through a network. The Check for Updates item has been removed from the Excel ribbon. NodeXL now automatically checks for updates once a day. 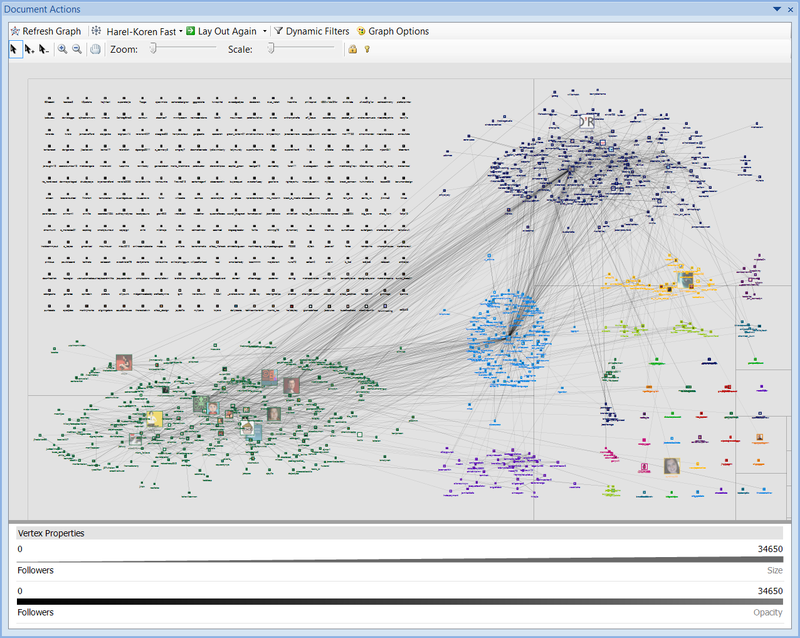 Once this release is installed, NodeXL will automatically update itself when a new release is available. You will no longer have to manually download and install new releases. This release and those that follow will all be referred to as “NodeXL Excel Template 2014.” New releases will continue to have version numbers, but the numbers will be less important in light of the new auto-update feature. 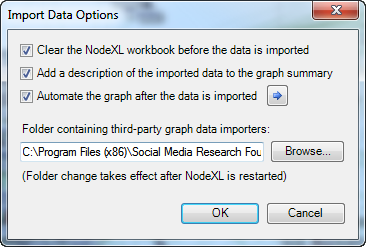 If you use third-party graph data importers, such as the Social Network Importer for NodeXL, note that the folder where the importers are stored has changed. 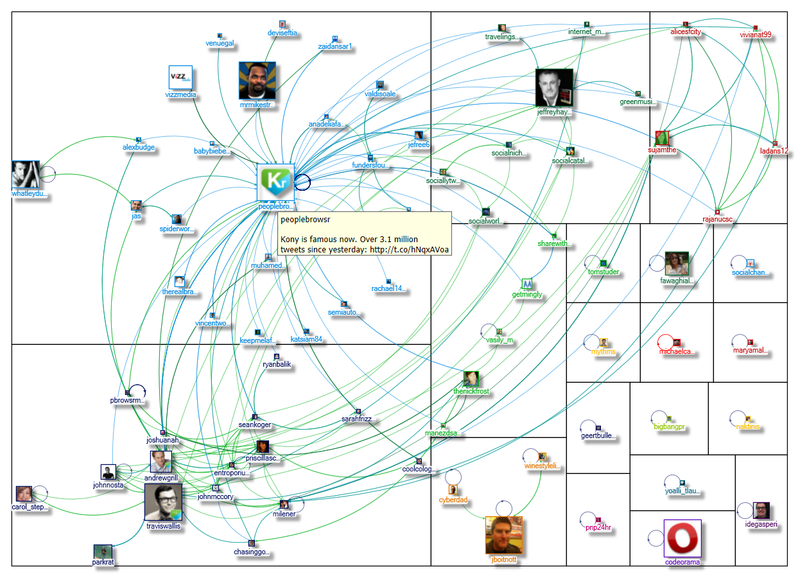 See “Using third-party graph data importers in NodeXL Excel Template 2014” at http://nodexl.codeplex.com/discussions/522826. If you use the NodeXL Network Server, an advanced command-line program that downloads a network from Twitter and stores the network on disk in several file formats, note that the program is no longer a part of NodeXL Excel Template. See “Using the NodeXL Network Server command-line program with NodeXL Excel Template 2014” at http://nodexl.codeplex.com/discussions/522830. When a Twitter network is imported, the hashtags in the “Hashtags in Tweet” (or “Hashtags in Latest Tweet”) column are now all in lower case. Previously, identical strings with different case letters would be counted differently. This is no longer the case and the result is that terms that had been divided are now unified. These terms will now have higher values and there will be more diversity in the top ten list. 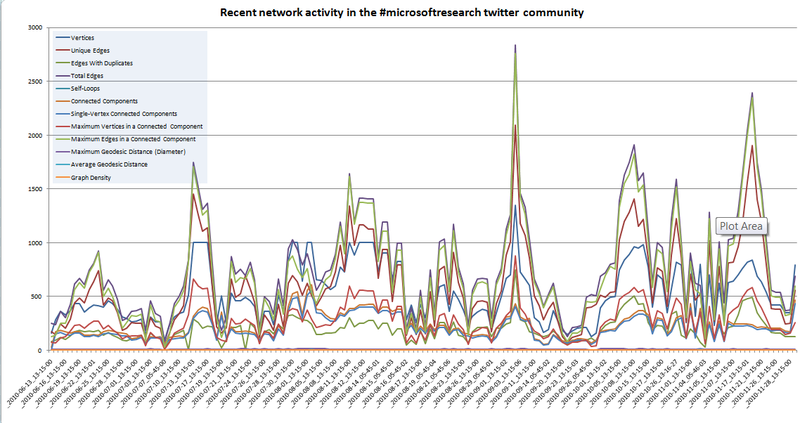 Thanks for using NodeXL and stay tuned for additional updates! Here is a map of connections among people who recently tweeted the term “peoplebrowsr”. I hear this reaction frequently when I show people maps I have made of social media connections. 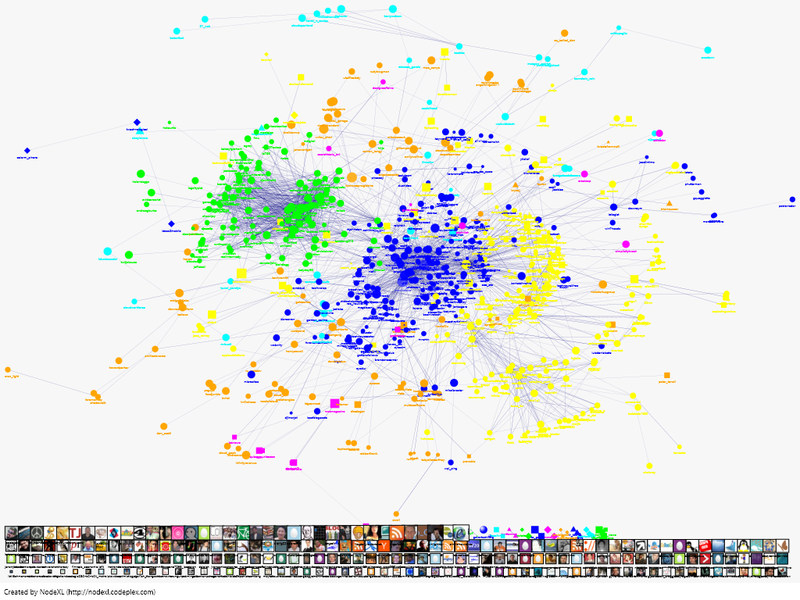 I often point out that the map and the data can reveal people who occupy important locations in the network as well as emergent clusters and groups. I hear this reaction frequently when I explain what is important about a network. 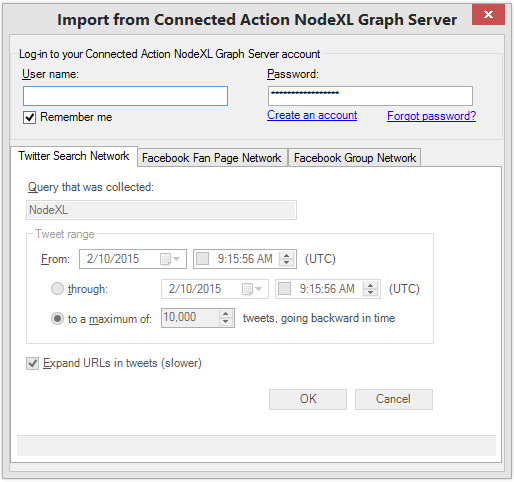 In NodeXL version 203 we have released a new feature called Graph Summary. Our goal is to “just say so”. 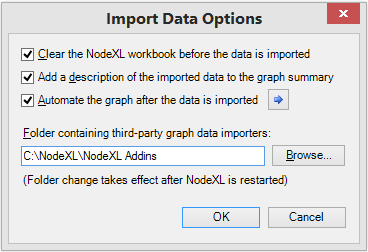 Note that NodeXL>Data>Save Import Details in Graph Summary must be selected in the Import menu for the “Data Import” field to be populated. users whose recent tweets contained "peoplebrowsr". Friday, 09 March 2012 at 01:21 UTC. There is an edge for each follows relationship. There is an edge for each "mentions"
not a "replies-to" or "mentions". Friday, 02 March 2012 at 02:39 UTC. Friday, 09 March 2012 at 00:47 UTC. 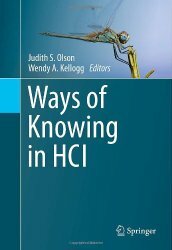 Harel-Koren Fast Multiscale layout algorithm. The edge colors are based on relationship values. The vertex sizes are based on followers values. 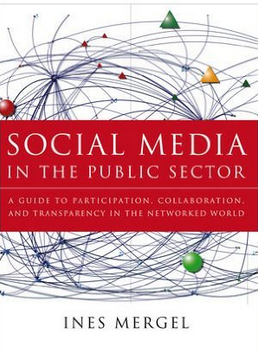 open tools, open data, and open scholarship. 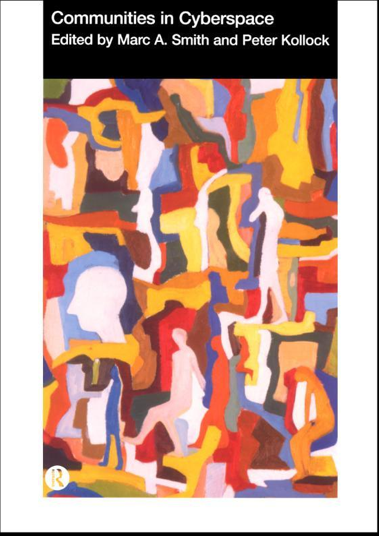 Insights from a connected world, is available from Morgan Kaufmann and from Amazon. This caption will expand in our next several releases to include information about the top URLs, hashtags, and @usernames in text fields associated with nodes and edges. 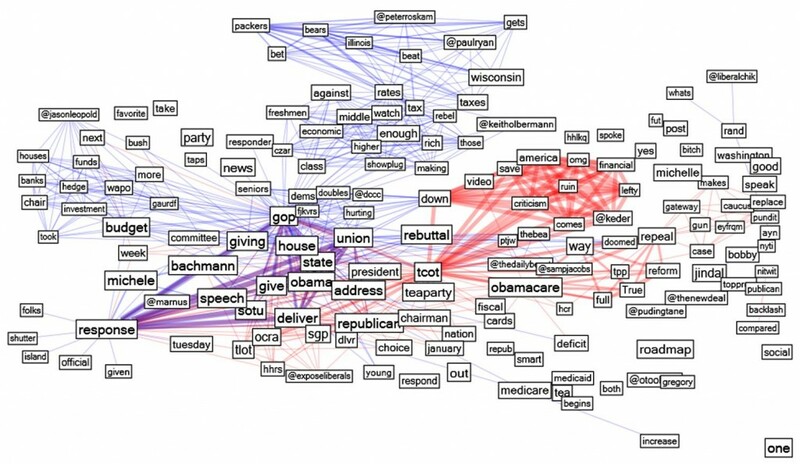 Following that we will release a series of features to allow for the extraction of keyword pairs in those text fields (our current version of this feature is described here: Keyword Networks: create word association networks from text with NodeXL (with a macro)). Curved edges have arrived in NodeXL (v. 174). The result is a slight improvement in readability. To start, the edges curve just a bit. Soon, we will allow user control over the extent of the curvature. 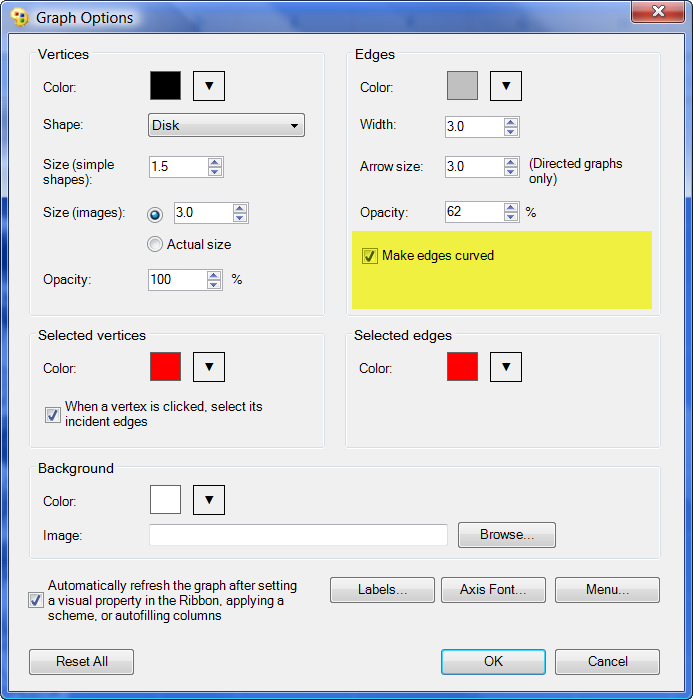 Turn on curved edges by checking the box in the Graph Options dialog accessed from the graph pane. Every network visualization should have a legend that explains what the colors, edge widths, and filters are that define the network graph. And the “Legend” option is selected. 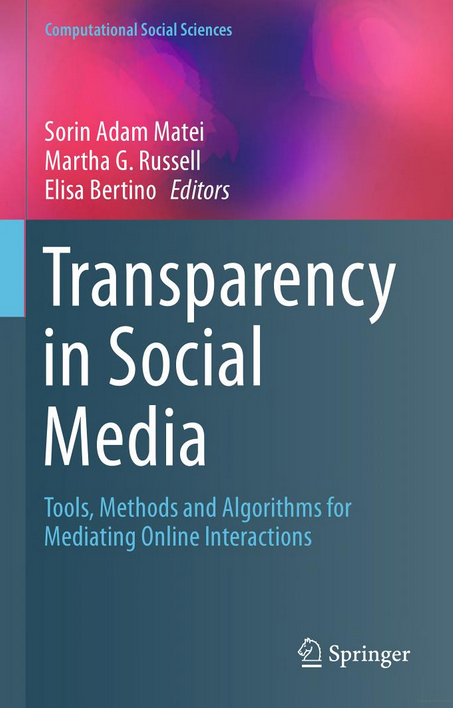 The NodeXL team at the Social Media Research Foundation is happy to announce the availability of the newest version: there is lots of new stuff in the latest release of NodeXL v.1.0.1.167! 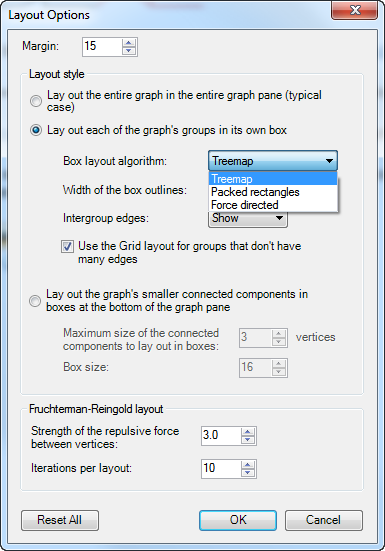 Group Frames: If your graph has groups and you choose to lay out the groups in their own boxes (NodeXL, Graph, Layout, Layout Options), you can now specify the width of the box outlines. Constant Edges: When you select an edge, its width no longer changes. NodeXL used to use the same width for all selected edges, even if the edges had varying widths when unselected. When a graph has groups, you now have more control over how the groups are shown. 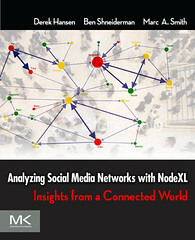 Go to NodeXL, Analysis, Groups, Group Options. 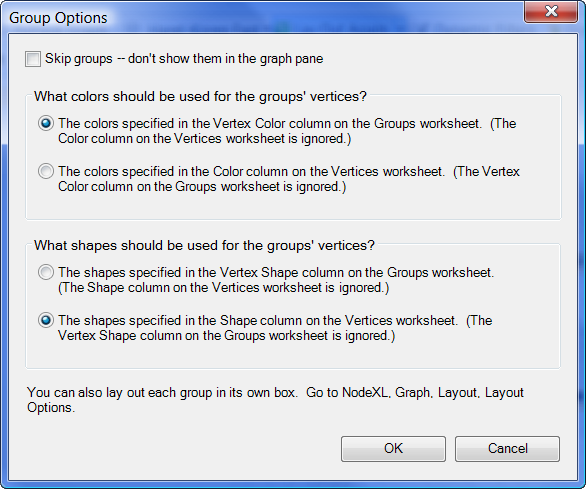 The NodeXL, Show/Hide, Graph Elements, Groups menu item has been replaced with a checkbox in the Group Options dialog box. 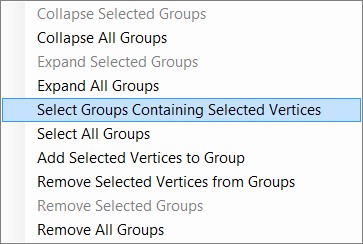 Hidden edges and vertices (those that have their Visibility cells set to Hide) can no longer be selected in the graph pane. 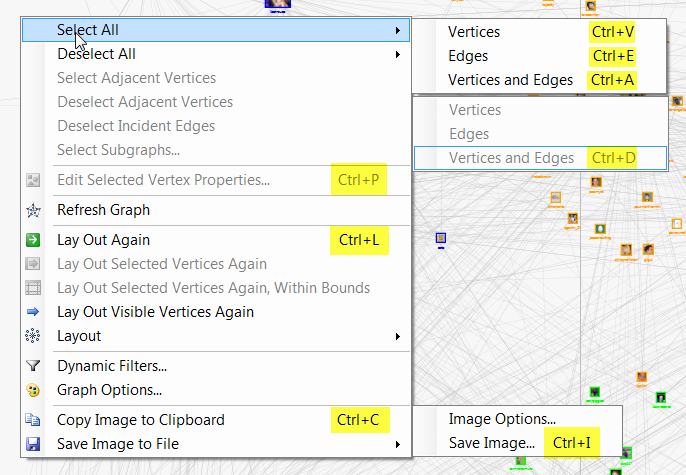 Edges and vertices that have been filtered (NodeXL, Analysis, Dynamic Filters) can no longer be selected in the graph pane. Bigger Twitter Lists: When importing a Twitter list network (NodeXL, Import, From Twitter List Network), you can now enter up to 10,000 usernames. The maximum used to be 500. UCINET / Matrix Compatibility: Bug fix: When exporting the graph to a UCINET file (NodeXL, Data, Export, To UCINET Full Matrix DL File), isolated vertices didn’t get exported. 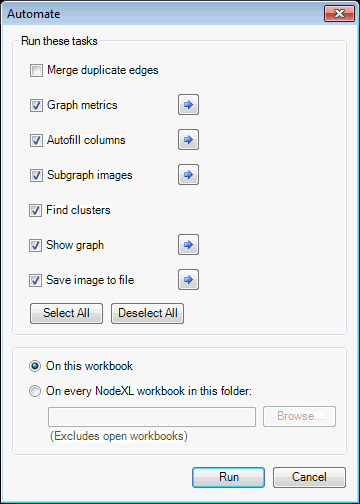 When exporting the graph to a new matrix workbook (NodeXL, Data, Export, To New Matrix Workbook), isolated vertices didn’t get exported, when importing a graph from a matrix workbook (NodeXL, Data, Import, From Open Matrix Workbook), isolated vertices didn’t get imported. Now they do! 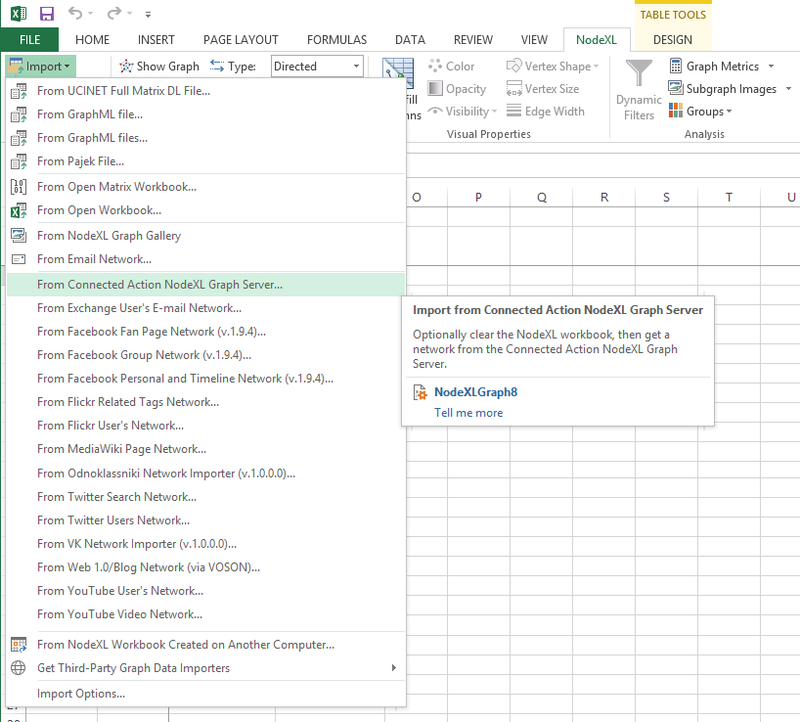 NodeXL now (v.166) offers users a set of keyboard shortcuts that can speed up your routine network layout tasks. Shift+arrow key to move the selected vertices a large distance. If you have any suggestions for other frequent tasks that could be accelerated with a keyboard command, please contact us on the NodeXL discussion board or here in the comments. 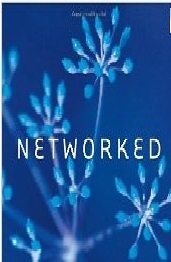 In many cases I look at a network graph and apply a series of operations to transform it into a more presentable form. 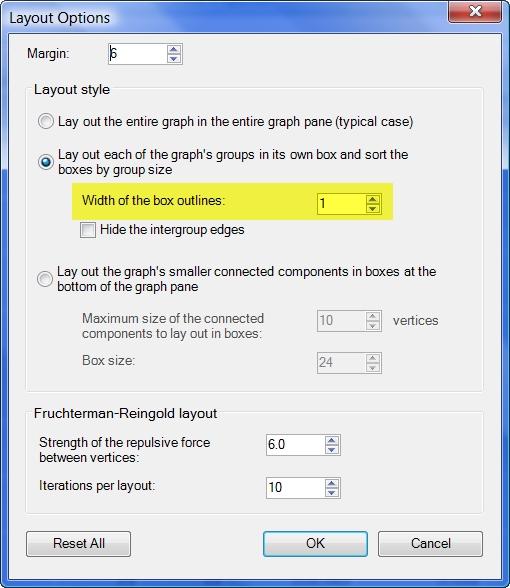 For example, I often calculate graph metrics, use Autofill columns to map data to display attributes like size, color, or shape, create clusters, sub-graph images, and then select the Harel-Koren layout and select the options so that small components get lined up in neat rows at the bottom of the graph. I like the edges to be gray and partially transparent. I often set the font size to a large 24 points because I scale the graph to about 10% of its full size to reduce occlusion. Carrying out each of these operations once is no problem. Repeat 100 times and there is a problem. The NodeXL team completed another phase of our automation feature, allowing users to build a refined graph with any set of configuration that can be applied to any number of other networks. 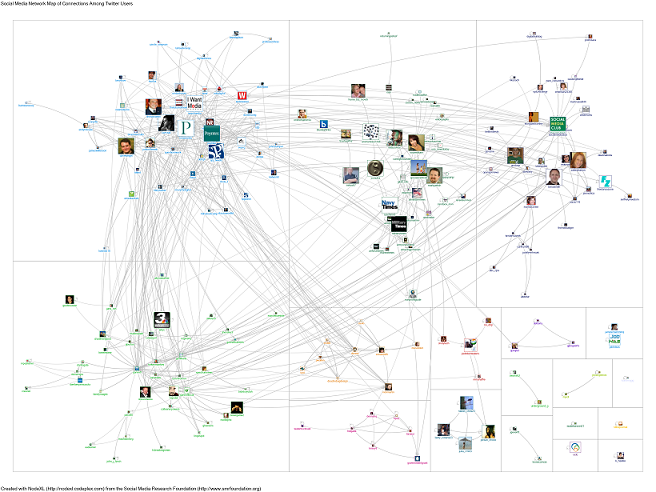 Along with the automated collection system, NodeXL can now generate a regular stream of network graphs from social media sources.